Scholastic Honors: Dean’s List (Highest Honors) at Tabor College; Recipient of the Kansas Governor’s Award; Recipient of the Kansas State Scholar Award; Recipient of President’s Award for Educational Excellence; Academic All-State Athlete; CBS Affiliate KWCH “Top of the Class” Award; Valedictorian of Arkansas City High School (#1 out of 156). Leadership Roles: Presidential Leadership Scholar at Tabor College; Led “Non-Alcoholic Beverage (NAB) Night” through college Student Activities Board; Sophomore Class Vice President at Tabor College; Assistant director/choreographer in Tabor College opera program; National Honor Society Secretary; ACHS Danceline Captain; First Chair Cellist in ACHS Orchestra. Accomplishments: Winner of Kansas Soundscapes Composition Songwriting Contest; Lead Actress in the Musicals Annie and All Shook Up ; Participant in an audition-only college choir group that tours annually; State Medalist in Piano; State Medalist in Tennis; Teen Performer in Music Theatre of Wichita’s Oklahoma . Interesting Facts: I have family that are of Canadian, Ethiopian, Japanese, and Hispanic descent as well as a German foreign exchange student brother; Danced in the Macy’s Thanksgiving Day Parade; Visited China and walked along the Great Wall; Actress in student-produced, film festival submitted movie The Running Joke ; Danced in a Rockette workshop in New York City; Won my local title with a cello solo/dance combination talent. Employment: Dance Instructor at Studio 23; Choreographer at Tabor College and Arkansas City High School; Cello Instructor at Tabor College Music Preparatory School; Writing Center Tutor at Tabor College. How has the world you come from shaped your dreams and aspirations? My dream is to put joy and hope back into the lives of the people who feel none; to help improve the quality of life of those with mental illnesses and the loved ones who are also affected. My faith has taught me to have joy in all circumstances and I long to bring that into others’ lives. My own Grammy’s battle with bipolar disorder and depression has shown me that hope is never lost, no matter how dark the world seems. Of all the ways you could succeed in your life, why have you chosen to succeed in the Miss America Program? 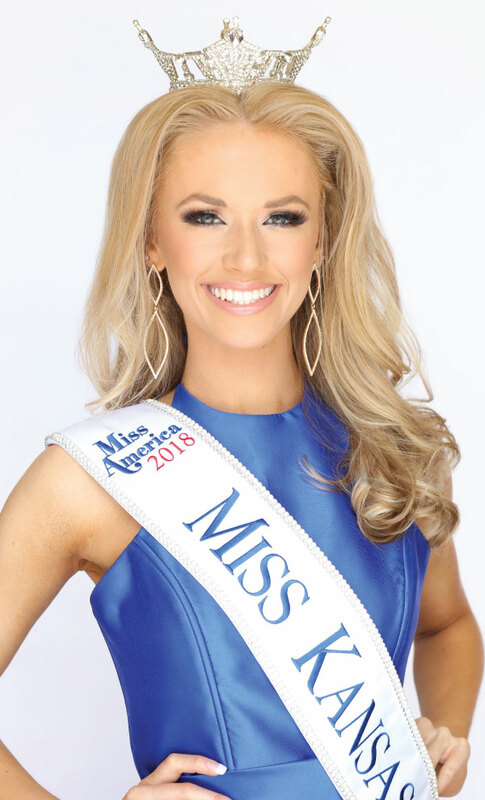 I believe the Miss America Organization provides the best program to encourage positive role models for younger girls, and I aspire to be one of those role models. It allows me to promote both physical health (CMNH) and mental health through my platform, The Mind Matters. I also know the Miss America Program empowers and inspires women to be authentically themselves, to serve others wholeheartedly, and to succeed in every area of life. What social issue, other than your platform, will have the greatest impact on your generation and why? I believe my generation has already been greatly impacted by the issue of gun control. Our country has been incredibly divided for years over how to prevent school shootings and mass murders, and a resolution is needed now . People need to be able to feel safe in their own churches, schools, theatres, etc. again. There is no single cause for these tragedies, yet mental health preservation and accessible mental health care are great places to start.